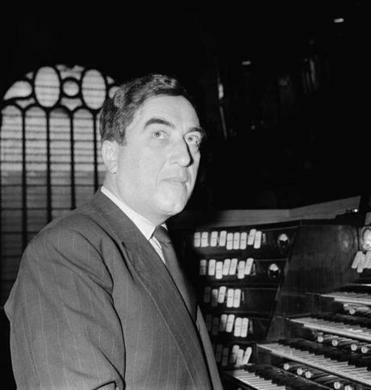 French organist and composer Maurice Duruflé in 1956. On Sunday the Masterworks Chorale presents an all-French program including two works by Maurice Duruflé (1902-86): his Requiem (Op. 9) and his motet “Ubi Caritas” (Op. 10, No. 1). The organist and composer was a parsimonious perfectionist, publishing fewer than 20 works in his lifetime, often reworking pieces even after publication. Duruflé, in many ways, kept the world at arm’s length; such reticence left him at oblique and sometimes uneasy angles to the century’s political and cultural turbulence. Like much of his other music, Duruflé’s Requiem was based on the ancient Catholic tradition of plainsong, the old chants providing the work’s scaffolding. The genesis of the Requiem, however, was deep in the weeds of World War II France. The French government had started a program of commissioning composers in 1938; with the German occupation and the partitioning of France, that program was taken over by the collaborationist Vichy regime, who began commissioning a more conservative slate of composers, Duruflé included. Whatever the exact terms of Duruflé’s 1941 commission (the details are murky), it sparked a long, winding road ending with the Requiem. Upon its completion, in 1948, Duruflé sent, in essence, an invoice to the postwar French government requesting payment. In a way, the request was also for exoneration; the Fourth Republic would not have rewarded a collaborator. Contemporary audiences heard the Requiem as a memorial to French victims of the war — an association that certainly aided the work’s popularity. But the complicated history hints at Duruflé’s determined detachment from everyday life. Over a decade elapsed before Duruflé’s next opus, the 1960 “Quatre Motets sur des thèmes grégoriens,” which includes his setting of “Ubi Caritas.” Duruflé again drew on plainchant, giving the melodies polished, elegantly supple harmonic shading. By then, the diffident Duruflé nevertheless had become something of a celebrity, embarking on successful concert tours with his second wife, organist Marie-Madeleine Duruflé. But another upheaval was on the horizon: the Second Vatican Council, which replaced the Catholic Mass’s Latin orthodoxy with vernacular accessibility. The chant-based regime of church music promulgated by Pope Pius X in 1903 — Duruflé’s native musical accent — was displaced. The changes seemed to cast Duruflé the composer into a kind of internal exile; he disapproved of the folk- and pop-inflected church music that came in Vatican II’s wake, but, apart from a late, 1977 French-language setting of the Lord’s Prayer, could not bring himself to compose any countervailing repertoire. The perfectionist’s meticulously crafted catalog became a hermitage.